A smart system that empowers lawyers to monitor their day-to-day activities. E-Law Solutions ® lets you focus on your profession and expand your potential through technology and business intelligence solutions. SOLUTIONS that bring you on top of things. With E-Law Solutions ® , you will have lesser worries on administrative nightmares and have more time to focus on your client and research. E-Law Solutions is a great collaboration tool if you have partners, legal assistants, and staffs in your law firm. 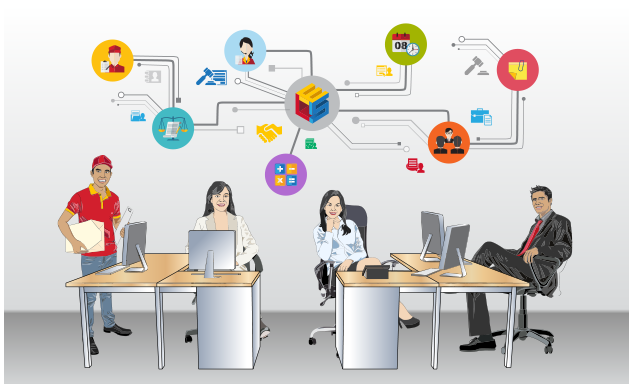 Now you can be updated with the functions and deliverables of your people and even yourself. 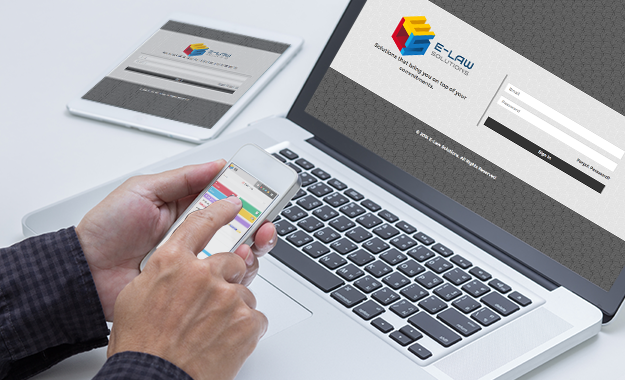 With E-Law Solutions ® you can access your law firm whenever and wherever you are. Optimize your computers, laptops, tablets, and smartphones, and make them aids to deliver your goals. Focus your time with clients and let E-Law Solutions do the rest. TECHNOLOGY meets LEGAL PRACTICE . We created E-Law Solutions ® to empower lawyers to monitor day-to-day activities because we know how tedious and how difficult it is to track your activities. Now, you will have lesser headaches and can be on top of your commitments and monitor the administrative and financial aspects of your profession. You can also easily track the progress of the cases and the status of client payments and receivables. Optimize your computers, laptops, tablets, and smartphones and make them aids to deliver your goals. More than research, they can be good tools to track your progress as well as your financial standing. With ELSA, you will have lesser worries on administrative nightmares and you will have more time to focus on your client and research. This is also a good collaboration tool if you have partners in your law firm or legal assistants. Now you can be updated with the functions and deliverables of your people and even yourself. Lawyers are first in our agenda but we will also target other professionals. We wish to assure you that our system works and very functional because our lawyer partner is using it! To be the leading solutions provider to professionals so that they will have more time in delivering their services to their clients and still be on top of their daily operations. To empower professionals to have more time to perfect their craft and expand their potentials through technology and business intelligence solutions. Atty. Marlon Valderama is the BRAIN the HEART of E-Law Solutions. He covers all areas of legal practice specializing in litigation, civil and criminal laws, immigration laws, corporate and investments laws, labor and tax laws, intellectual property and telecommunication laws, real property and agrarian laws, family law, energy, mining and environmental laws. He also maintains excellent relations with all branches of government. Having 12 years of experience as a lawyer, and having achieved his goals of lending a hand to Overseas Filipino Workers, his vision now is to help other lawyers to practice their profession with the support of technology in handling backend operations. Atty. Valderama is committed to provide excellent legal services to his clients at reasonable rates with the end in view of maintaining long business relationship with them. In return, he wants to empower the young lawyers to do well, to have more time in sharpening their saw as lawyers, and spend more time with their clients. 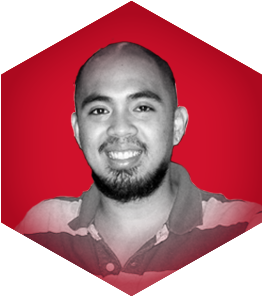 He partnered with Gino Cortez, Rigie Fernandez, and Joni Jocson in order to bring his idea into reality. Mr. Cortez handles all the technical aspects of the project. 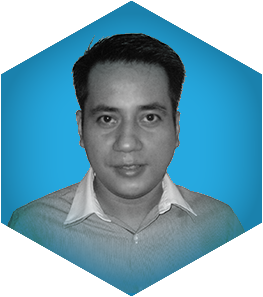 He has 10 years solid experience in web application development, mobile development, testing, troubleshooting, and implementation. He has strong knowledge of technical specifications, workflow development, risk management, and quality assurance. Mr. Fernandez handles all the creative components of the project. He has 15 years of solid experience in advertising and promotions; print design and prepress production; web design, user interface and interaction; web development, hosting and management; and social media and web marketing. He has implemented projects for both local and foreign companies. 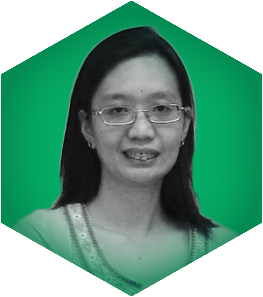 Ms. Jocson handles all business and account management components of the project. She has 20 years of experience in account management, sales, marketing, project management, operations and finance and has exposure in small medium scale businesses, banking finance, manufacturing, service oriented companies and information technology. Convenience, powerful monitoring tool, timely information and updates, and constant reminder when E-Law Solutions ® is around. Get empowered by ELSA ® now! Convenience, powerful monitoring tool, timely information and updates, and constant reminder when E-Law Solutions® is around. ELSA ® is user-friendly and has functional features that come in handy to your law office. Here are just a few highlights of what is in store for you. But there are lots more features available to address your requirements. You can now manage your schedules and not miss any meetings or deadlines. The calendar can also indicate schedules of hearings, schedules of your junior partners, billing schedules, collection schedules and others. All standard documents are already available and all you have to do is fill in the blanks for the details and it can just be extracted as a final document for sending to client. No more headaches of misplacing or loosing the document. Just look for the saved copy or start from scratch again but lesser time needed to accomplish. You can now keep track of all the cases that your law firm handles. You can also keep track best practices. You will now have a rich database of cases that may guide you in your future endeavors. This will also be very helpful to your junior partners. You can now track all details about your client and the database will help you know your clients better. This will also help you keep track on historical transactions with clients. Identify when you first met your clients and clients who bring in continuous business to your law firm. You can just electronically track your documents. No need to maintain huge filing cabinets and have multiple copies of the documents. You will also be environment-friendly. Just print the document if and when necessary. Preparing a billing statement for your client is now made-easy. ELSA can also flag you if you missed to bill a client and can also flag you when the payment is due or if the account is in arrears, AND MANY MORE! BEST TIME TO GET ELSA IS NOW! Get in touch with us now for a presentation schedule and to know how ELSA can be of help to your profession. Copyright © 2014. E-Law Solutions. All rights reserved. Atty. Marlon Valderama is the BRAIN the HEART of E-Law Solutions. He covers all areas of legal practice specializing in litigation, civil and criminal laws, immigration laws, corporate and investments laws, labor and tax laws, intellectual property and telecommunication laws, real property and agrarian laws, family law, energy, mining and environmental laws. He also maintains excellent relations with all branches of government. 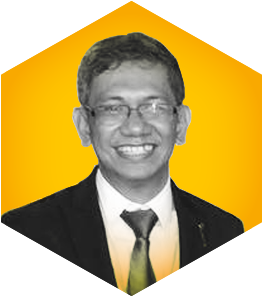 Having 12 years of experience as a lawyer, and having achieved his goals of lending a hand to Overseas Filipino Workers, his vision now is to help other lawyers to practice their profession with the support of technology in handling backend operations. Atty. Valderama is committed to provide excellent legal services to his clients at reasonable rates with the end in view of maintaining long business relationship with them. In return, he wants to empower the young lawyers to do so as well, to have more time in sharpening their saw as lawyers and spend more time with their clients. We've received your request for a demo. We'll be getting in touch with you about how you can use ELSA's smart system to help you in your profession and your law firm. Should you have other inquiries, feel free to call us at (+632) 451-1594. We have received your message and we'll respond to you shortly.